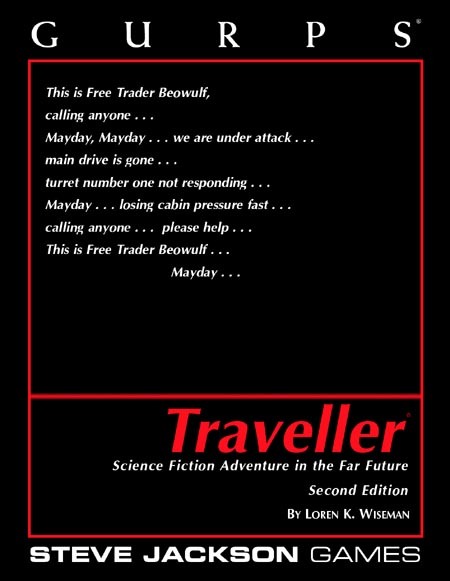 p.83: Wealth is now based on character's TL, and a relevant discussion of starship ownership in Far Trader is cross-referenced. p.108: The Personal Armor sidebar has been replaced with a discussion of Imperial military equipment and TLs. p.114-115: Malfunction numbers were added to the weapons tables. p.119: We replaced the fractional G numbers on the Travel Times Table with whole numbers. p.120: The jump masking rule from Far Trader was added. p.121: We clarified a number of points about fuel in the sidebar. p.122: The Trade and Commerce rules were changed to bring them into line with Far Trader. 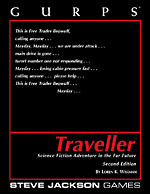 p.124-125: Character conversion from previous versions of Traveller was simplified. David Pulver made a few minor tweaks to the starship design rules, based on information acquired after the close of the formal playtest boards. Adjusted Gunner skill (p. 163): The base bonus is now +7 rather than +4. This means you can hit targets much more often. Collision and Point Defense Phase (p. 168): Major changes to the way missiles attack and point defense occurs; tactically, they make it harder for missiles to score hits (especially at long range); in game terms, they make space combat more playable. Point defense fire is rewritten. Each beam weapon can only fire once in the point defense phase. If its gunner scores multiple hits (p. 168) he may divide these hits among different targets (e.g., several missiles) rather than hitting one target more than once, as long as these other targets are craft that are no harder to hit than his first target. This means a single beam may, on average, stop two or three missiles. Sandcasters may be fired as point-defense weapons: treat them as TL10 turret lasers for this purpose. A hit destroys a single missile but has no effect on larger vessels. Missile use their controlling Gunner's skill with a -1 per 3 hexes range from controlling spacecraft to the target. Add the target's Size Modifier to rammer skill; a craft with a higher acceleration adds half the difference in G to skill (round down). And Missile explosive damage is now 6d × 60(10) at TL10 or 6d × 80(10) at TL12+. Meson Guns (p. 171): Meson screens substantially less effective. Space WEapons Table (P. 173): Errated range, damage of spinal mounts reduced. RoF Bonus Table (p. 174): Bonus changed so that all weapons get an extra +3 to hit (reflecting three seconds of aim...). Note that there is an error in the text (not table) that says +4 when it should say +7.